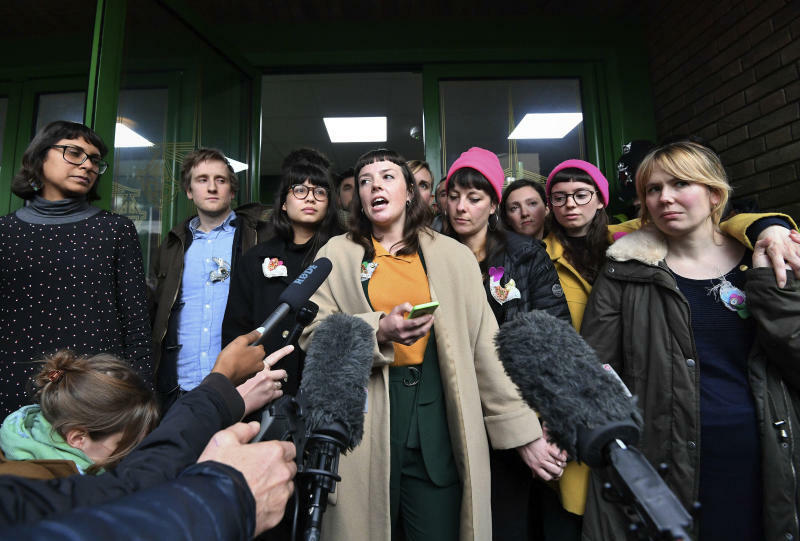 LONDON (AP) — Fifteen protesters who locked themselves together around a plane at London's Stansted Airport to stop migrants from being deported were spared prison sentences on Wednesday. The demonstrators cut through the airport's perimeter fence on March 28, 2017, then used expanding foam, scaffolding poles and lock-box devices to secure themselves to the wheel and wing of a Boeing 767. The plane had been chartered by the government to repatriate passengers to Nigeria, Ghana and Sierra Leone. The 15 activists were found guilty in December of breaching aviation security law after a prosecutor said they had put the "safety of the airport in a likelihood of danger." Judge Christopher Morgan told the group Wednesday that there could have been "catastrophic effects" if any debris had been left on the runway from the March 2017 protest. He gave three protesters who had previous convictions suspended jail terms and sentenced the other 12 to community service. Supporters of the group criticized the use of a terrorism-related charge — intentional disruption of services at an airport — that carries a maximum life sentence. A group of U.N. human rights experts said they were "concerned about the application of disproportional charges for what appears to be the exercise of the rights to peaceful and non-violent protest and freedom of expression." The demonstrators plan to appeal their convictions. In a statement read outside court, they said their convictions were an "injustice that has profound implications for our lives."